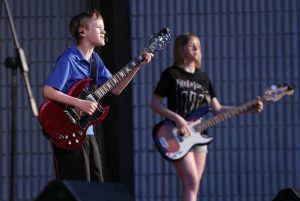 Palatine Park District and Salt Creek Park District will host the annual Teen Battle of the Bands this summer at Twin Lakes Recreation Area, 1200 E. Twin Lakes Drive, in Palatine on Monday, June 12 at 7:00pm. The two districts have extended their submission deadline one week and are now accepting applications from interested teen bands age 12-20 through Friday, April 21. Those selected will have the chance to compete for the chance to perform at the Illinois State Fair in August. For over a decade, the Illinois Park and Recreation Association’s Teen Committee has worked with Park Districts throughout the state to present these local battles, placing winners into regional competitions, and ultimately hosting regional winners at the Illinois State Fair finals. Judges provide feedback for bands at each level of the competition and top bands often win additional chances to play at other events. For Palatine local battle participants, the top band will get the opportunity to perform at Village of Palatine’s Street Fest. The Palatine local battle will feature three to five teen bands to be selected by Palatine Park District and Salt Creek Park District staff. Each selected band will get 15-20 minutes to perform. Bands will be ranked by judges in the areas of stage presentation, stage management, sound quality and musicianship, originality, and audience response. Following the performances, judges will determine and award the top three bands. The June 12 competition is free to attend and open to the public. In the event of inclement weather, the performance will move indoors to the Palatine Park District’s Cutting Hall Performing Arts Center, 150 E. Wood Street, in Palatine. Contact Ashley Schiavone, Cultural Arts Coordinator for Palatine Park District, at 847.496.6237 or Jessie Thompkins, Recreation Supervisor for Salt Creek Park District, at 847-934-6050 with any questions regarding Battle of the Bands participation.